Go to Academics > Course Groups. If the group is for a Degree Audit, give it a simple name like Studio Art. If it's for a fee, maybe go with something like Studio Art Fee. If it's for a course prerequisite, use the course abbreviation: e.g. ART 301 Prereq. Select a year. This refers to the first academic/catalog year for which this particular group will be available for degree course requirements. This particular course group definition will "stick" from year to year until you redefine it for a future year. For example, if you define it for 2008-2009, and then redefine it for 2012-2013, the '08-'09 definition applies up until the '12-'13 Academic Year commences. To select courses from multiple departments, choose a different department from the drop-down. Available Courses will update but Selected won't be affected. Use the year selector to pick the course group's year definition that you want to modify. For years in which the course group was not manually defined, you'll see the following note: This course group definition has been carried forward from the yyyy-yyyy definition. When updating a group because of a change in degree requirements, make sure you select the correct year (so everyone's degree audits stay straight!). Editing a course group works just like creating one—select the department, choose the courses, and so on. Click Save Course Group when you're done. You can also delete the definition for that particular year. 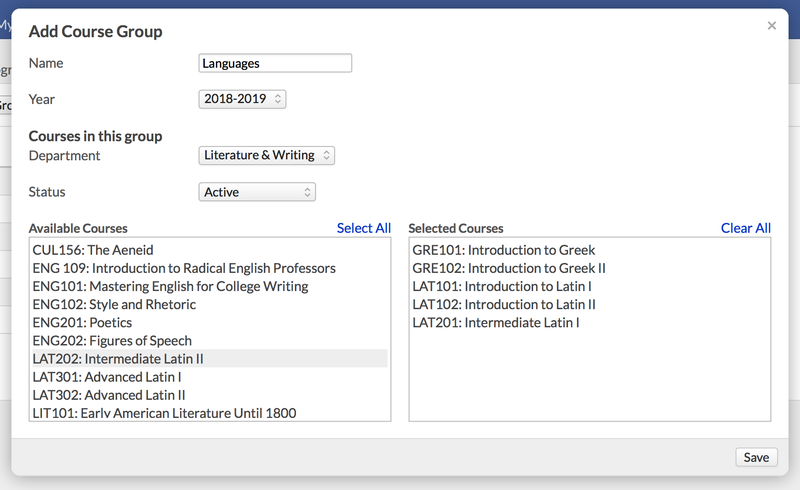 These instructions work whether you're modifying a course group that has already been defined for a particular year or updating a group for a different academic year. To get the B.A., every student has to pass your core classes (English, Math, Science, History, Electives). For the Classics major, you require Ancient Literature, Classical Languages, and some advanced History Seminars. Literature requires some Ancient Literature, Modern Literature, Poetry, and Criticism courses, together with a Thesis Seminar. Create a Core course group and apply it to the B.A. For the Classics major, you'd create Ancient Lit, Latin, Greek, and Ancient History Course Groups. For Literature, you'd create groups for Modern Lit, Poetry, Advanced English, Criticism, and the Thesis Seminar. You'd also incorporate the same Ancient Lit group you used in the Classics major. As you can see, course groups aren't limited to any one degree—if your degrees' requirements overlap at all, just use course groups to reflect that. When included in course prerequisites, course groups let you define two or more courses as equivalent to each other for the purposes of the prerequisite. That is, a student must pass any one of the group's courses to satisfy the prereq. Let's say you offer LIT361: Contemporary American Literature and you want students in this course to have a grasp of American history or literature. Now a student need only pass one of these courses to qualify for LIT361.